Learn about the three benefits of holiday home shopping. We are entering the holiday season, and what better way to celebrate the end of the year than by finally purchasing your dream home! There are many builder discounts and incentives that come at the end of the year, so coming months are some of the best time’s to buy a home. 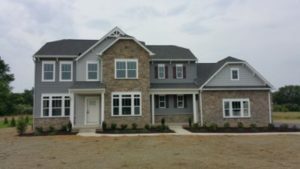 By starting the design and construction process now, your family will be in your new home by spring! Continue reading to learn about the benefits of holiday home shopping, then call Rainbow Construction for any questions about building your dream home. As mentioned above, the end of the year typically comes with more builder discounts and incentives that can help save a good amount of money when buying a home. Also, vendors that supply the builders may offer discounts, and many builders provide those extra savings by passing them down to buyers. Purchasing a home in the fall or winter is also great for tax savings. If you buy before December 31, you can use the property on 2018’s taxes. This means that you can deduct mortgage and interest taxes, which can come with great savings! If you choose to purchase an existing home rather than building a new house, you will find much less competition this time of year. With the holiday season coming up, most people are planning vacation and family gatherings or spending their money on Christmas presents. In general, the real estate market is pretty slow from Thanksgiving to February, which makes it easier for buyers to negotiate with a seller. The downside is that fewer houses are coming on the market in the winter, but if you find a home you love, you won’t have to compete with other buyers to get the best deal! Just like you want to enjoy the tax savings on your new home, many sellers want to enjoy those tax savings on the next home they purchase. A seller is more likely to accept a lower bid in the fall or winter to meet the end of the year deadline. However, it’s always important to follow the advice of your real estate professional, no matter what month it is! This entry was posted on Friday, November 9th, 2018 at 2:39 pm. Both comments and pings are currently closed.